For starters, it can be hard to guess how much soap each mold holds (hard if you don’t read the description on the site like me!). So to determine the capacity of a mold, just fill it with water, then pour that into a measuring cup. Voila! 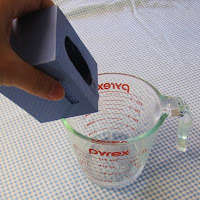 That’s how much you need (add 1/2 oz more to make up for soap left in your cup). Avoiding this is easy – it just takes some attention while you’re pouring. First, spray the surfaces of the mold lightly with rubbing alcohol before you pour. This helps pop bubbles on contact and thins the soap slightly so it flows into the tiny details better. Next, pour your soap pretty hot so it’s not thick at all. Just make sure that you don’t overheat your soap, causing bubbles. Once you have poured, allow it to sit on the counter and harden at room temperature. Since the molds are so soft, it’s hard to move them without squeezing your soap and spilling or wrinkling the soap surface. Also, the silicone insulates very well, making it take longer to cool than in a traditional hard plastic mold. Getting the soap out is definitely the fun part! Just pull the sides of the mold away from the soap – there will be no resistance at all – and stretch it while pushing the soap up and out. It’s super easy! Check out the full line of Soapylove supplies right here at Bramble Berry! Previous Post: Who Wants to be a Millionaire? I use cold process method, so I hope this trip works with this method also. I also need to know what effect does the alcohol have on silicone molds. they are really expensive so I just need to make sure I can use this method to avoid bubbles, and not damage my molds. I have blades of grass that have bubbles, Help! These are adorable. Making my mum some. What colors did you use for these 3 examples? Just love it! I know she used the Soapylove Jewelry Box Colorants so I’m guessing she played around with a mixture of clear and white soap using the Turquoise Blue. I love how they turned out too. A suggestion on keeping soap from seeping into the lip butter pots? I don’t know how well it would work, as I’ve not tried it myself, but it just came to me as I was reading the post… What if you took a bit of the melted MP soap and swiped it around the seam of the pot to create something of a seal? 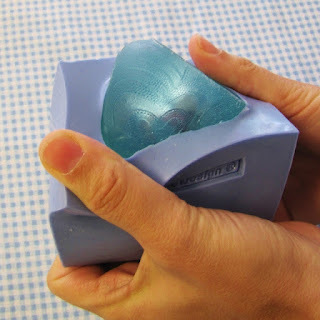 Because it’s soap, once the treasure was retrieved, it would easily come off then when rinsed, but might be enough to keep soap out during molding. Just a thought. Anyway, cute idea as always! Love the blog! PS: Congrats on the young master to be! So versatile with the projects you can do too. Oh said, I would have been so bummed. 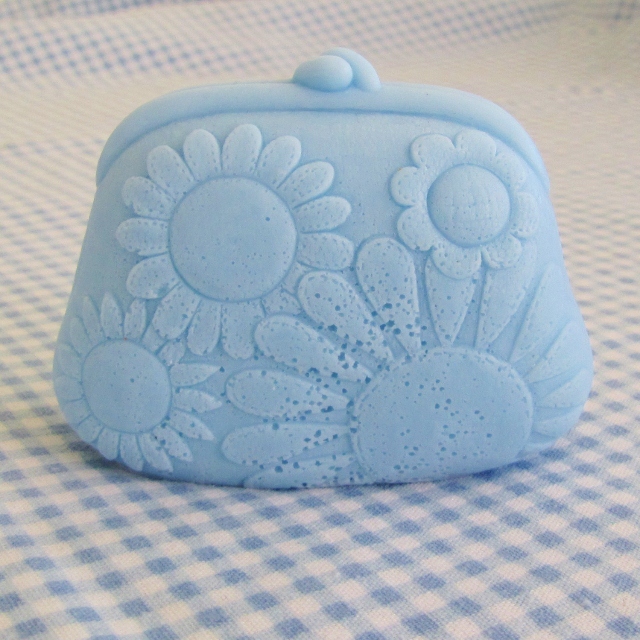 This is the only ‘tricky’ silicone mold we have and we just adore how cute the soap comes out. The ELF tractor is adorable. And with the little hamster in it? It is positively drool worthy. We have a SoapQueen.TV episode on making your own molds out of Flexy Fast. Have you seen it? I love the detail in all of those molds. The purse mold is very cute! So cute! What a great mold! I love the Kudos Richard molds….a long time before you bought his line for BB I was salivating over them…he has good taste I think. And so do you! I love silicone molds, but Elf makes some really great molds too! I have really enjoyed my Elf tractor mold, and my Elf Scalloped Mold. Other than that, it would be super embarrassing to tell you how many molds I have melted, cracked, broken, warped, used a heat gun and ruined. Silicone is definitely easy and long lasting! My only problem with that is, I usually can only afford to buy one at a time. Some of my silicone molds cost upwards of $70 each…..but so worth it to have a one of a kind. Someday I’d love to make my own.. Erin Pikor did a blog post about how she made her macaroon molds….definitely an adventure! How do I know if a recipe is hard? 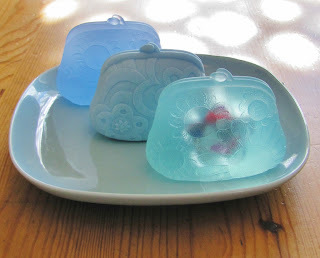 Can these molds be used for cold process soap? Just LOVE the little purse…. 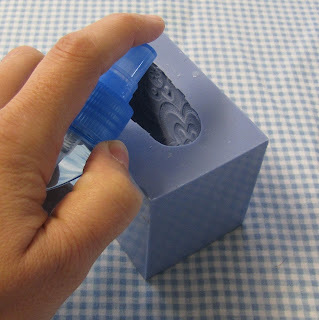 Great tip on getting the soap out of the mold! The first time I tried it with a custom silicone mold I pulled out the soap the wrong way and cracked the mold slightly. It’s still good but now I know better.